Employee wellness programs: Yay or nay? Should you start an employee wellness program in your company? Learn all about the benefits and potential risks of implementing an employee wellness program so you can make a well-informed decision. Employee wellness programs are on the rise: Should you join this trend? Employee wellness programs are on the rise. More employers are offering employee wellness programs than ever before. 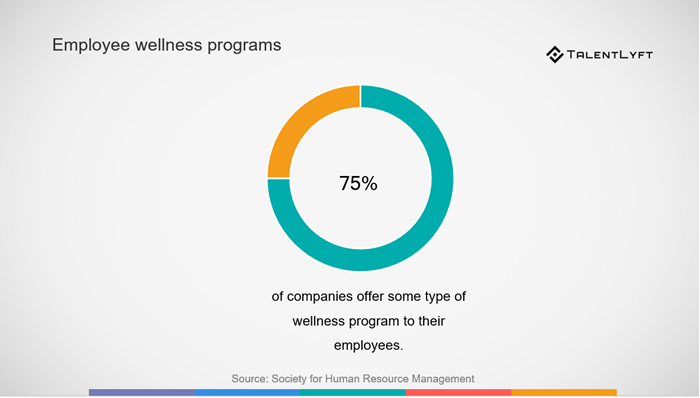 A research conducted by the Society for Human Resource Management has found that 75% of employers offer some type of wellness program, resource or service to employees. According to Global Wellness Institute research, workplace wellness is currently a $47 billion industry, with employers tending to spend more on employee wellness each year. If you’re reading this article, you’re probably trying to decide if you should join this workplace trend. Should you start an employee wellness program at your company? If you want to make the right decision, you first need to learn all about the benefits and potential risks of implementing an employee wellness program. What are the potential benefits? Are there some risks? Are employee wellness programs worth the investment? If you’re looking for the answers to these and similar questions, you’ve come to the right place. In this blog post you will discover all the pros and cons of employee wellness programs backed by data and research. Let’s start by investigating the potential benefits of starting an employee wellness program at your company. The benefits of employee wellness programs have been thoroughly researched and documented. What did the researchers find? What are the key reasons for starting an employee wellness program? This survey found that 73% of employees without access to wellness programs want them. Experts from the Johns Hopkins Bloomberg School of Public Health analyzed surveys to determine the overall perceptions of wellness programs from employee and employer perspectives. Their data analysis revealed that about 59.4% of employees think employers should attempt to improve the health of their workers. Employer review site Glassdoor found that 79% of employees would choose new benefits over a raise. The most popular benefit was health care, chosen by 40% of employees. Send out a survey to make sure your employees really want wellness programs and consider them a benefit. Simply ask your employees if they are interested in having access to this type of services at your office. Implementing a workplace wellness program can help your company save money in the long run, according to research. Among the 22 different studies that looked at wellness programs and healthcare costs, the average return on investment was 3.27. This means that for every dollar that was spent on the program the company saved $3.27 because of reduced healthcare costs! Another study by the University of Louisville found that every dollar invested in a wellness program generated $7 in healthcare savings. In other words, keeping employees healthy is not just good for the business, it's also good for your company’s bottom line. There are many insurance companies who offer lower insurance premiums for companies who have implemented an employee wellness program. The Centers for Disease Control and Prevention (CDC) has found that productivity losses related to personal and family health problems cost U.S. employers $1,685 per employee per year, or $225.8 billion annually. A research published in the Journal of Occupational and Environmental Medicine has found that employees who take part in employee wellness programs are more productive than those who don’t. A survey by the American Psychological Association has found that an overwhelming 91% of employees at companies that support well-being say they feel motivated to do their best at their jobs. Indiana State Department of Health has found that employers save on average $5.82 in lower absenteeism costs for every dollar spent on employee wellness programs. Employee wellness programs are a successful strategy for keeping your employees productive. If you’re looking for additional ideas to keep your employees happy, motivated and engaged, check out a list of completely free employee engagement strategies you can implement today. According to the AFLAC Workforce Report, employees who took part in a workplace wellness program are more satisfied with their jobs than those who don’t partake. A research conducted by an American Psychological Association has found that fewer (only 25%) employees in companies with employee wellness programs intend to leave their job in the next year. In companies without employee wellness programs, twice as more employees (51%) said they intend to leave their job in the following year. Check out our cool infographic showing 7 most interesting facts about employee turnover! If you’re not tracking your employee turnover rate, you will definitely benefit by reading our article explaining how and why you should calculate employee turnover rate. 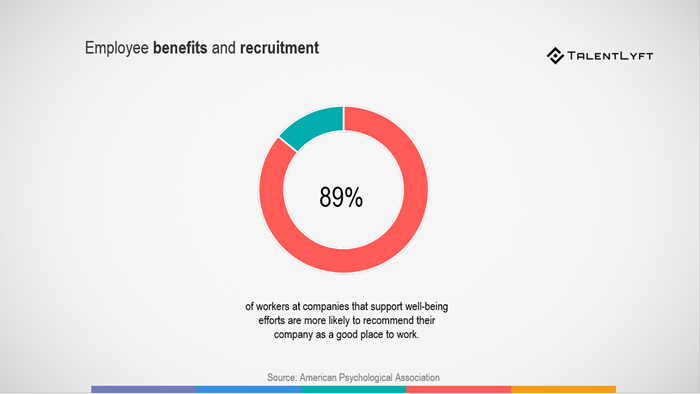 According to the research by American Psychological Association, 89% of employees at companies that support well-being efforts are more likely to recommend their company as a good place to work. Make sure to include your employee wellness program in your employee value proposition. Promote your employee wellness program on your career site and on social media to attract top candidates. Let’s take a look at the potential risks and roadblocks you should keep in mind if you want to start the employee wellness program in your company. Starting an employee wellness program can be a costly endeavour. 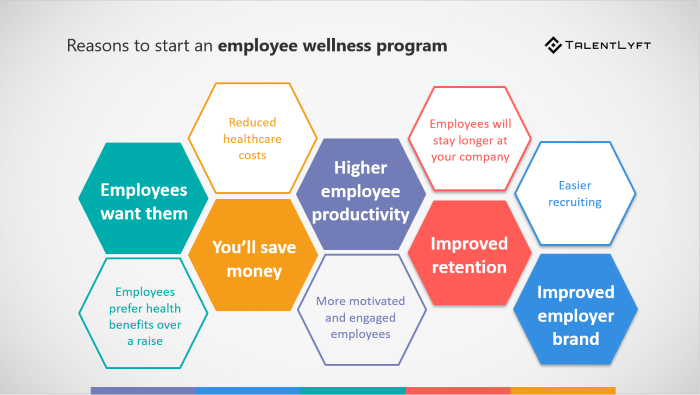 According to WellStep, the total cost of employee wellness program is between $150 and $1200 per employee per year. This is a huge amount of money. However, more affordable options that cost between $3 and $7.5 per employee per month ($36 -$90/ year) are also available. Depending on your budget and your needs, employers can choose the best option for their company and their employees. No matter how much money you’re willing to invest in your employee wellness program, you’ll benefit in the long run. There is an interesting study that measured the impact of the Highmark employee wellness programs on 4-year healthcare costs. This study has found that a comprehensive health promotion program can lower the rate of health care costs and produce a positive ROI. Another study on the Johnson &Johnson employee wellness program has found that an average annual per employee savings were $565, producing a return on investment equal to a range of $1.88—$3.92 saved for every dollar spent on the program. The International Foundation of Employee Benefit Plans Workplace Wellness 2017 Survey Report has found that 92% of workplaces offering wellness programs and tracking wellness ROI report their initiatives as very or somewhat successful. If you don’t have a large budget, start with a smaller employee wellness program initiative that requires less financial investment. For example, you can replace your existing vending machines with the ones that offer healthier drinks and snacks. Another idea is to organize healthy potluck lunches in your office. Start small, measure and improve with time. Your employees might worry about the misuse of their health data. They might refuse to participate in your employee wellness program because of fear that your workplace wellness program could be putting their health data at risk. Some employees might be afraid to participate in your workplace wellness program for fear that other employees will find out things about them that they want to keep private. Others might be embarrassed to share information about their weight, or feel like a request to share their personal health data is an invasion of privacy. Make sure your that your company clearly, early and transparently communicates the specific data your wellness programs will collect and what will be done with the obtained information. Employee wellness programs: Worth the investment? We carefully examined all the data-backed pros and cons of implementing an employee workplace programs. The research shows that employee wellness programs have more advantages than disadvantages. Employee wellness programs can help you save money, increase your employees’ engagement, productivity and job satisfaction. Starting an employee wellness program can also help improve your company culture and your employer brand. It also makes it easier for you to retain your best employees and attract top candidates. However, there are also some risks associated with implementing employee wellness programs you should consider, such as privacy concerns and financial requirements of these programs. If you address these potential risks in an effective way, both your company and your employees can benefit greatly from implementing an employee wellness program.